Prometheus Q/A Results: Does Patent Eligibility Impact Biotech Research? 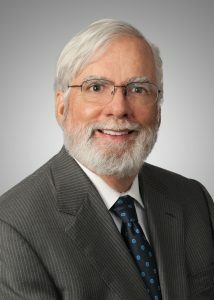 A guest post from shareholder Robin Chadwick of SLW. 0% of respondents’ R&D is affected by whether or not a project was patentable. Similarly, 50% of respondents report that aspects of R&D are modified by whether their R&D is patentable. Most of those who responded were involved in the business of diagnostic methods (95%), recombinant technology (81%) and/or nucleic acids or proteins (90%). 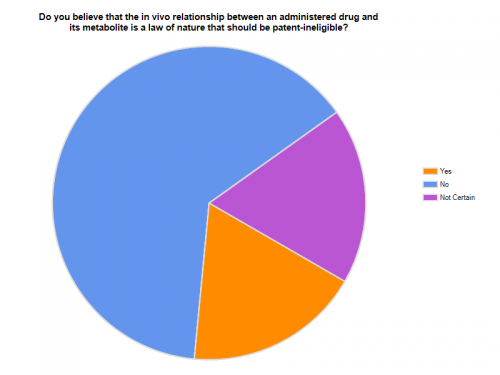 Sixty-four (64%) of respondents stated that diagnostic method claims should be eligible for patenting when drawn to an in vivo relationship between an administered drug and its metabolite concentration. Even more (87%) believe that isolated DNA should be patent-eligible. Some of those who responded were highly critical of the Supreme Court’s decision re Mayo Collaborative Services v. Prometheus Laboratories, Inc. (Mar. 20, 2012). (2) The Sup Ct’s demonstrable unfamiliarity with basic biological science has resulted in opinions which add layers of unpredictability to the patent system as applies to pharma. Personalized medicine requires the development of technology – usefully applicable scientific discoveries – in order to bring helpful, cost effective therapies to those who suffer from the most difficult to treat diseases. (3) The lack of scientific knowledge or the importance of patents for U.S. innovators in the Supreme Court is astonishing. Why don’t they just let the Court of Appeals for the Federal Circuit handle patent cases? (4) I’ll be brief and blunt: the result in Mayo Collaborative Services I can accept, but the reasoning provided is atrocious, including misstatements of basic patent claim terminology, as well as illogical and conflicting legal reasoning. I could do better judging patent eligibility with an Ouija board. However, some respondents commented more favorably on the Supreme Court’s decision. Definitely going in the right direction for companies wanting to compete in the market. No impact or no significant impact on upstream “observations” (they are not inventions). This entry was posted in Patent Eligible Subject Matter and tagged Patent Law, Prometheus v. Mayo, robin chadwick, Supreme Court. Bookmark the permalink.